Here's a close up of the embossed frame detail. 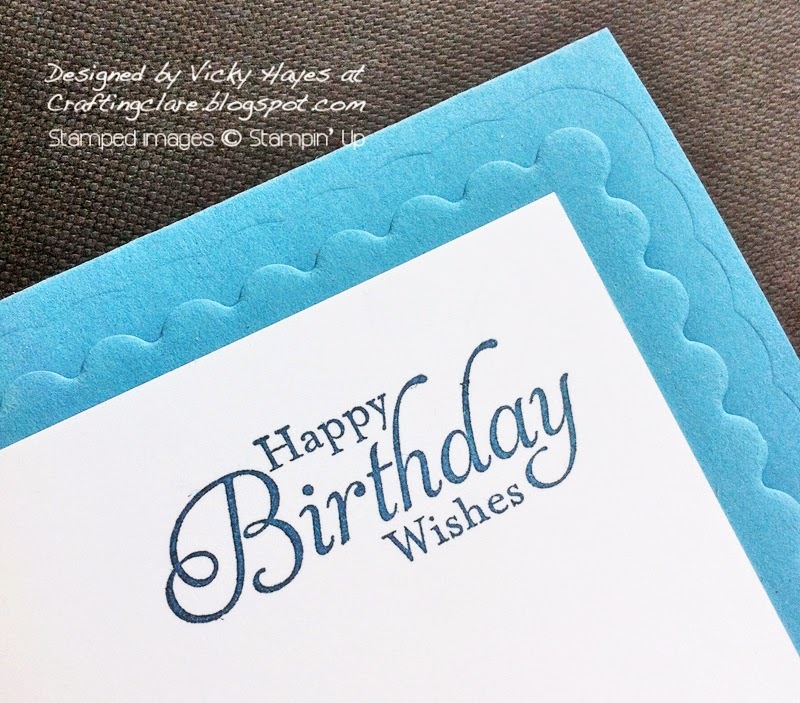 Framelits are great for embossing with and this scalloped one from the Squares collection gives the card an extra large postage stamp look! I shall be linking this card up with The Card Concept where the theme is Butterflies, Mrs A's Butterfly challenge where yellow is required this week (my butterflies ARE yellow I promise Mrs A! ), and Seize the Birthday where they're all about birthdays! I don't think I'm a complete slouch on the technology front but there's always an element of sighing and eye rolling if I ask my children for help. In retaliation, I behave like a decrepit old lady, asking them to ring me on the telephonic instrument or asking them whether they've downloaded the latest gramophone record onto their ipods. One of my favourite stamps Vicky and so beautifully used. Wow, Vicky this is really beautiful. Love the soft colors and the most of all the embossed frame, this is such a great idea. 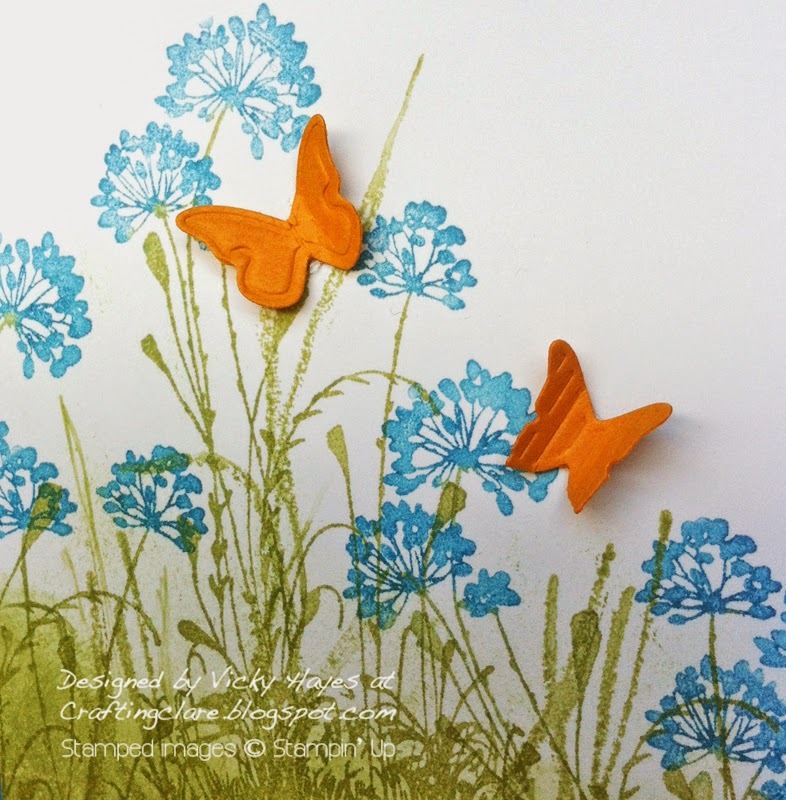 Amazing watercolor stamping and sweet butterflies. Great job! Well I love the look of the card with either the yellow OR the orange butterflies! Just one word - Beautiful! Yes, what does one do with one's old 78s these days?! I reckon you are as good at the technology as you are at card making, Vicky - which is pretty damn good! A beautiful card Vicky. I am resisting going anywhere near google+ though I suspect that googlle is going to make us all go that way in the end. There is one blogger who I cannot leave a comment on who has google plus as every time I try to I am requested to give my personal details to sign up. (I do not wish to do that. Never ask a lady for her D.O.B!!!). Anyway I digress. I love how you have used the frame in the same colour as the card to give that postage stamp look. Never thought of that. The blue is such a pretty shade too and looks super with the gorgeous colour of the butterflies. A really pretty card. Thank you for fluttering by #4. So very beautiful Vicky, I love the card, whether your butterflies are yellow or orange LOL. Haven't heard of the auto enhance feature, perhaps I should look out for it, hope it advises you first? This is so soft and pretty! I love how you've used the framelits to emboss. Great idea! Vicky this is just beautiful! 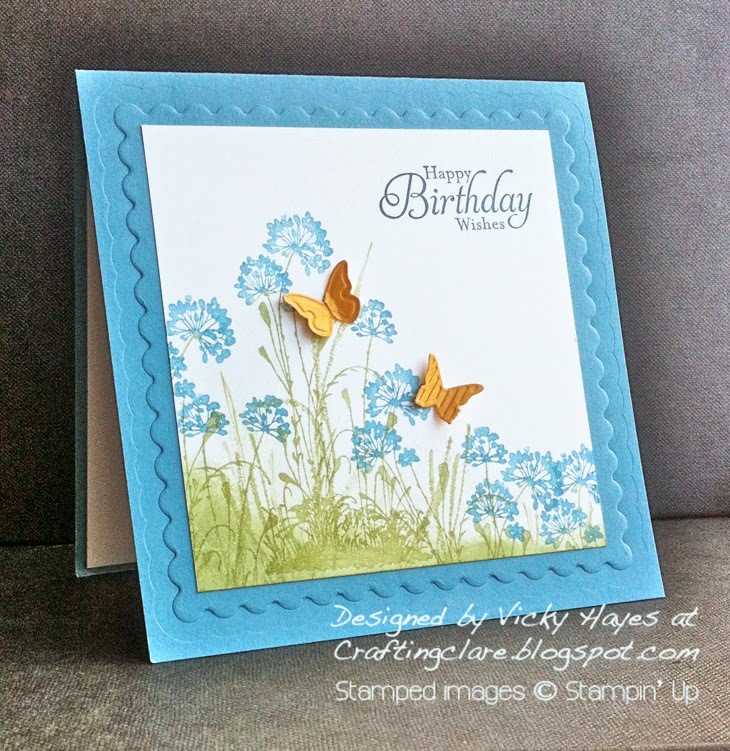 I love how you've used Serene Silhouettes on your card and the little butterflies are so sweet! thanks for joining us at The Card Concept!